State intervention in education throughout much of the world is a relatively recent phenomenon. In general, it is associated with the foundation of modern industrial nations. The models of state education usually adopted, however, derived many of their characteristics from the dominant providers for centuries, namely, faith-based organizations. These have included, but have not been restricted to, organisations from the Judaeo-Christian tradition and Islam. Along with providing schools on the home front, outreaches were also developed to service emigrant communities, and to assist in the missionary work of evangelization. This latter work continues today along the traditional pattern of running schools, technical and vocational education and university education, as well as hospitals and social-care facilities in long-established mission settings. In more recent times, however, faith-based organizations, like individual-country aid agencies, multi-lateral organizations and NGOs, have also been responding to various crises situations around the world, including those generated by famine, climate, disease, and conflict and post-conflict. The general focus of this chapter is on the work of faith-based organizations in a particular form of post-conflict setting, namely, that of ‘post-new-war’ societies. This notion of ‘new wars’, coined and elaborated on by Kaldor in her recent pioneering research at the London School of Economics and Political Science, refers to those wars which have their origins in the informal wars of the second half of the twentieth century and have become most prominent in recent decades with the disintegration of authoritarian states. Thus, ‘post-new-war’ societies relates to such post-military conflict zones as Iraq, Northern Ireland, Lebanon, Kosovo, Solomon Islands and Rwanda, to mention just a few. 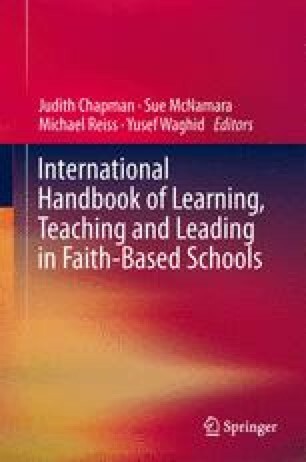 Specifically, the chapter provides a brief outline of the historical background to the outreach work of faith-based organizations, particularly through schools; broadly portray the ways in which faith-based organizations have become involved in various crisis situations around the world; elaborates on the nature of ‘new wars’ and ‘post-new-war’ societies as one type of such crisis situations; considers the recent emphasis in the academic literature on the importance placed by academics and multi-lateral organizations on the role of education in post-new war settings; illustrates a variety of initiatives undertaken by faith-based organizations in the provision of education, particularly schooling, in ‘post-new-war’ societies and draws on the small, but significant, body of work which has been undertaken in the field to date, which should be instructive to leaders of faith-based schools (and of state schools and schools run by non state secular organizations also) in their decision-making, particularly with regard to leading learning.